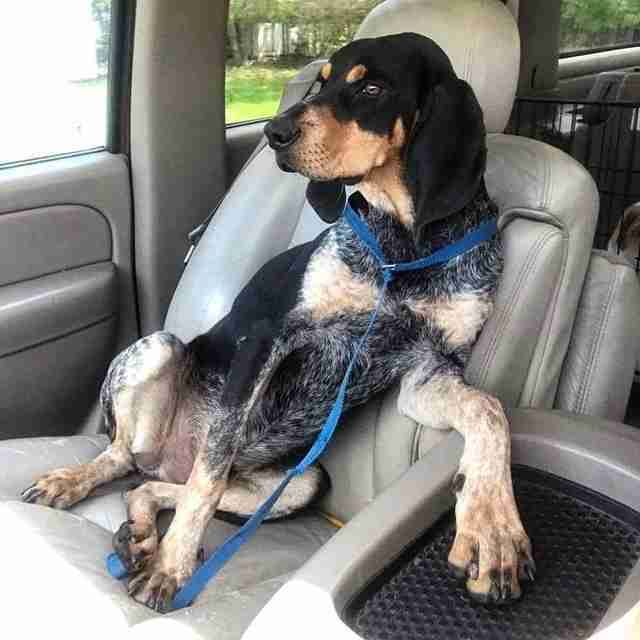 So many dogs who end up in shelters don't get a chance to show how personable and unique they are - and this was nearly the fate of Stryker, a gorgeous 10-month-old bluetick coonhound who somehow ended up as a stray. Stryker was taken to a high-kill shelter in Union County, South Carolina. People expected to see the sweet dog claimed, but no one came for him. But his floppy ears and sad face made quite an impression on just the right person, who saw his photograph online. "I saw his picture last week and just loved his ears," Mia, a board member with All Breed Rescue Vermont, told The Dodo on Monday. The volunteer-run rescue group saves dogs from getting euthanized by finding loving homes for them in the Northeast. "Our rescue often works with high-kill shelters to rescue them and bring them up North to adopt them out," Mia said. The group has already rescued over 6,000 dogs since 1996 - and Stryker is lucky enough to be next. He will arrive in Vermont this week and people will start looking for the perfect home for him. "I can't wait to meet him!" Mia said. As Stryker was preparing for the trip up from South Carolina, his rescuers wanted to see how the former stray would handle being in the car. And that's when the dog's quirky personality began to really shine through. He tucked in his hind legs, leaned his back against the seat and placed a paw on the arm rest. "I sent a message to my contact down South asking her how he rode, and she sent me that picture back," Mia said. "We were cracking up! What a funny guy." "Stryker is feeling fine on his freedom ride," the group posted this week. "We love him already." If you are interested in adopting Stryker, you can fill out an application. You can also donate to All Breed Rescue Vermont to help them save more dogs in need.